← Pizza + Pulled Pork. Genius. Dark Chocolate Creme Brulee. I only make it about once a year, not because it’s complicated, because it is that good. I have to really, really love you to make it. If you had it all the time, it wouldn’t be that special right? I’d also weigh 100 pounds more if I did eat this all the time. This batch was part of New Year’s Eve dinner. The first time I made this, the person across from me (marumodern) put down his spoon, looked up and said quite earnestly, “This is so good. I could punch you in the face right now.” While the imagined violence doesn’t sound like a compliment, if you’ve ever tasted something that caused you to want to lose your mind- this was just that dessert. Don’t worry friends, I was never in any danger! Creme Brulee (which is like super delicious pudding, actually a custard, but beyond that) seems very complicated and it must be since it’s only served at fancy restaurants for a bargain dessert price of about $12. Don’t believe the hype!! It’s so easy, even a six-year-old can do it! You may have to break the eggs for said six-year-old and handle the oven portion but beyond that it’s just measure, stir, put it in oven, put in fridge, torch. The other special piece about this recipe is that it serves two people. Most Creme Brulee recipes make about 8 servings. That’s a lot of Brulee and personally, I think it’s a little tough to serve at a dinner party. When you want to serve it there is fire and torches involved, sometimes that’s not the best solution when there may have been cocktails involved early in the evening. Plus it can take awhile to torch the sugar on 6-8 servings of these, you’d miss half the party. There’s something a little romantic about having just two of these and breaking out the butane. My recipe is a combination of using some of how Cook’s Illustrated prepares their regular vanilla creme brulee (technique-wise) and the meshing and messing with the ratios and ingredients between that and an Epiqurious recipe. Cook’s Illustrated suggests placing a towel into the bottom of the baking dish where your filled ramekins will sit during baking. This helps them to not slip around. Like this tip. Pour your boiling water into one corner of the baking dish this helps to not have it land in your creme brulee that is ready to bake. It will make its way to all the sides of the dish. Pour your boiling water into the pan once you have the pan on an oven rack. It’s tough to move the baking dish full of boiling water into the oven. If you use smaller, shallow fluted creme brulee dishes- the typical white ones you always see- check your time early. I found the shallow dishes cooked in only 20 minutes as opposed to the deeper ramekins which took about 30-35 minutes. If you don’t have a torch, you can broil the sugar on the finished custard. Broil it until the sugar is golden brown. Watch it closely so it doesn’t burn- maybe 1-3 minutes. Printable Recipe click back there! Prep your pan and preheat your oven. Boil your kettle of water. 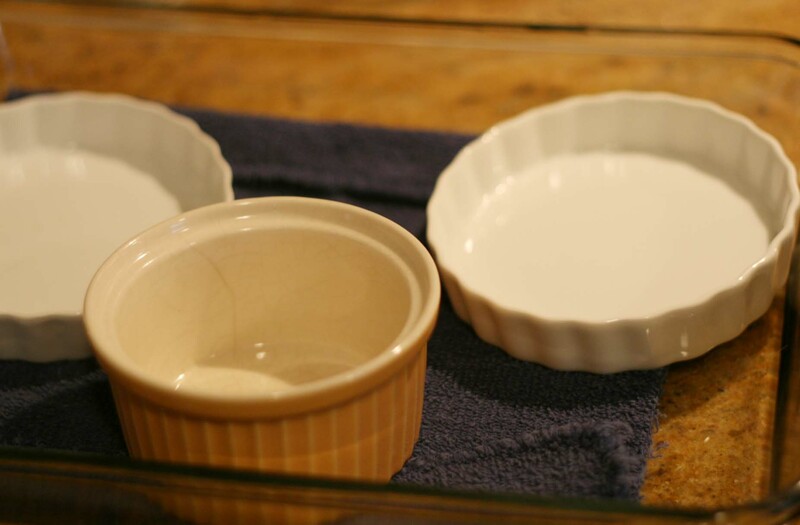 Put a small towel on the bottom to keep the glass dishes from slipping and sliding around in the water that is to come. I used three dishes so the picky eater could try some. He loved it. The recipe for two made enough to fill the shallow white dishes and the ramekin. Start the cream and sugar a’ boiling. 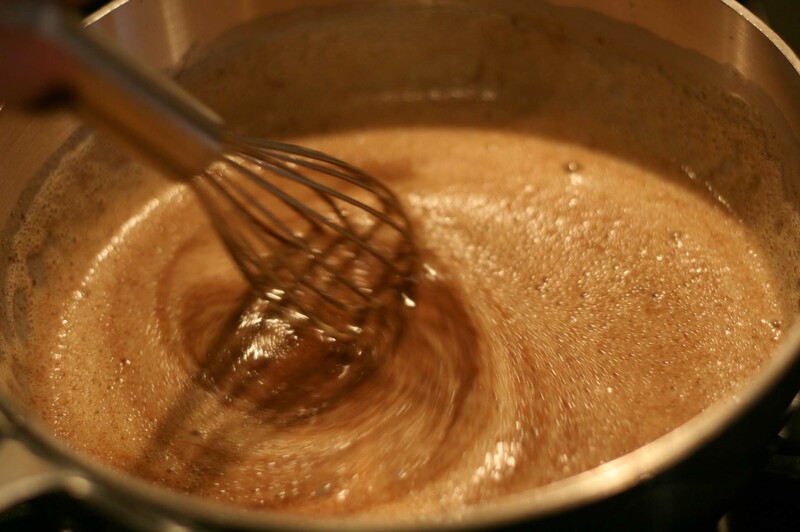 Bring 1/2 cup cream, sugar and pinch of salt to a boil. Stir occassionally. 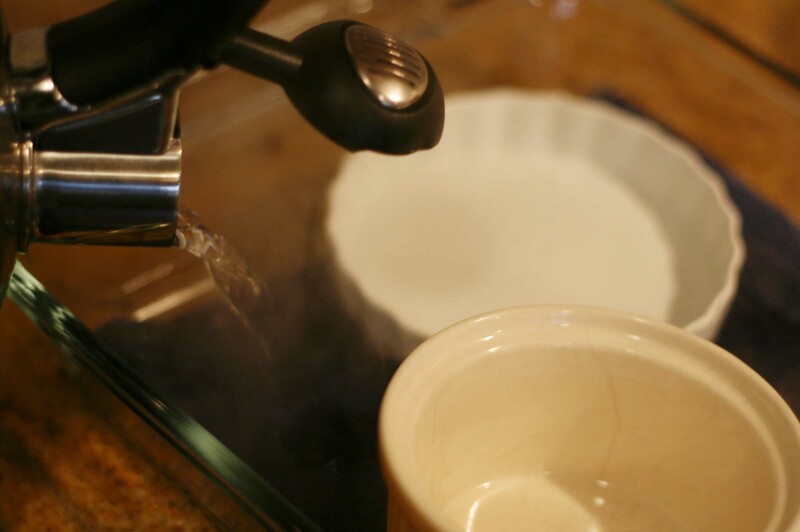 Turn heat to low when it comes to a boil. When the cream bowls, turn the heat to low. Grab your chocolate. 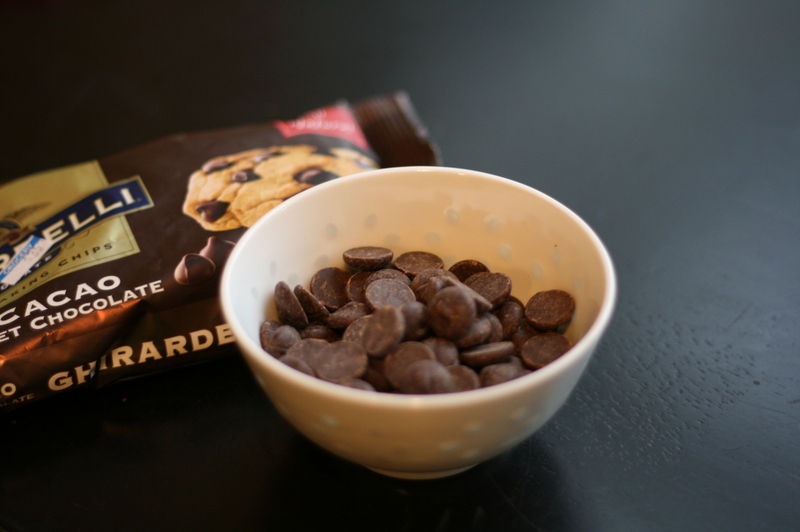 You can use chips or baking chocolate from a bar. You'll need about 3 ounces either way. 4 ounces if you plan to nibble from the bowl before it hits the cream! 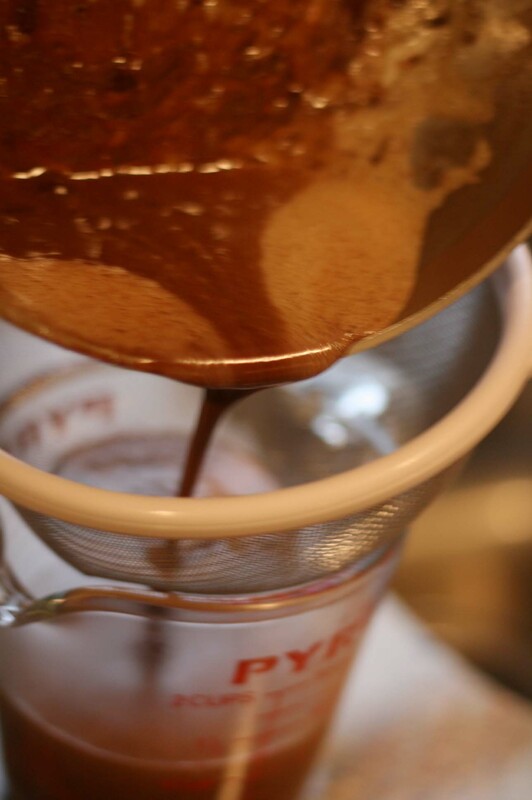 Whisk in the chocolate to melt it. Remove the mixture from the heat to let it begin to cool a little. After it cools a bit, add the remaining 1/2 cup cream to it and stir it up. You want it to cool a little, otherwise when we introduce the egg yolks you could have custard with scrambled eggs. We have to temper the eggs before adding them in to the heated cream/chocolate. 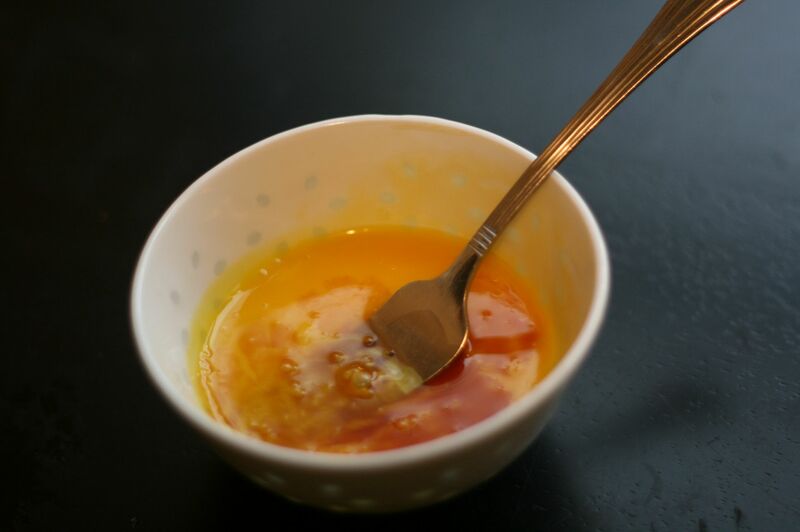 Now mix up your egg yolks and vanilla together in small bowl. I really like this brand of vanilla. You can usually find it at Penzey's or Williams-Sonoma. 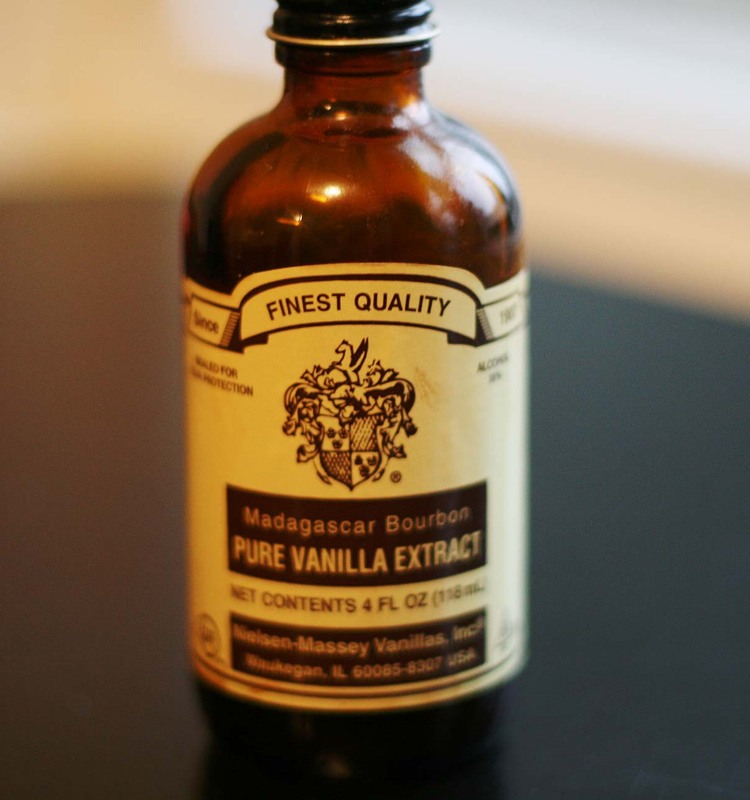 Whatever vanilla extract you have will work fine though. Don't feel the need for $8.00 vanilla. 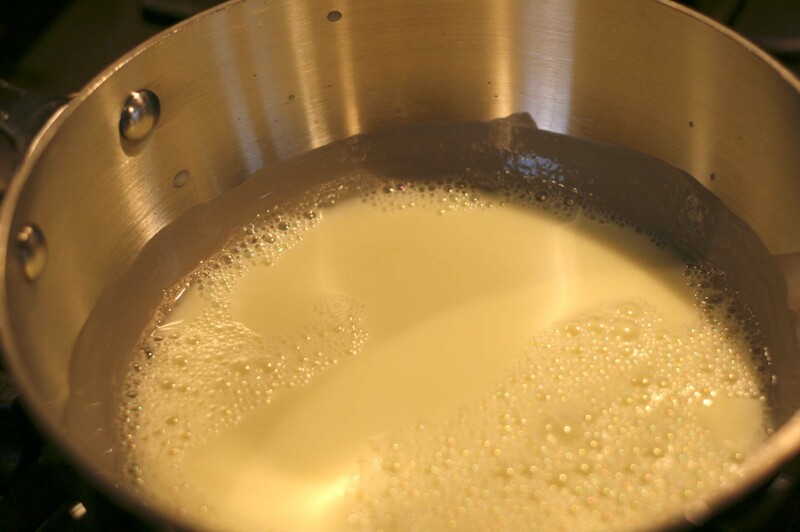 Add 1/4 cup of the cream mixture in to the yolk/vanilla bowl and mix together. Once combined, add another 1/4 cup and combine. Then dump the egg yolk mixture into the original saucepan of cream mixture. Combine it all together and strain it to get rid of any lumpy, clumpy things that may have occurred between the yolk and cream. 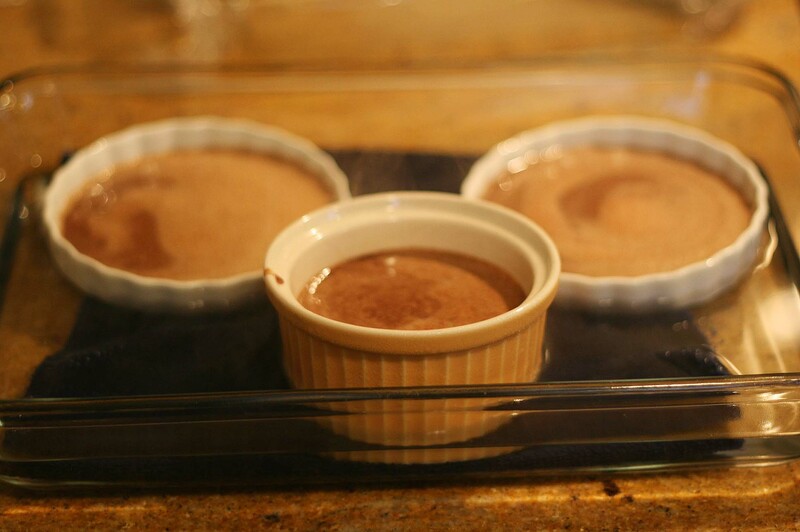 Now take your pitcher-lipped measuring cup and divide that creamy chocolately mixture between your prepped ramekins. If you don’t have one of these little lipped measuring cups, you can strain the mixture in to a bowl and then just use a ladle to pour the mixture in to the ramekins. 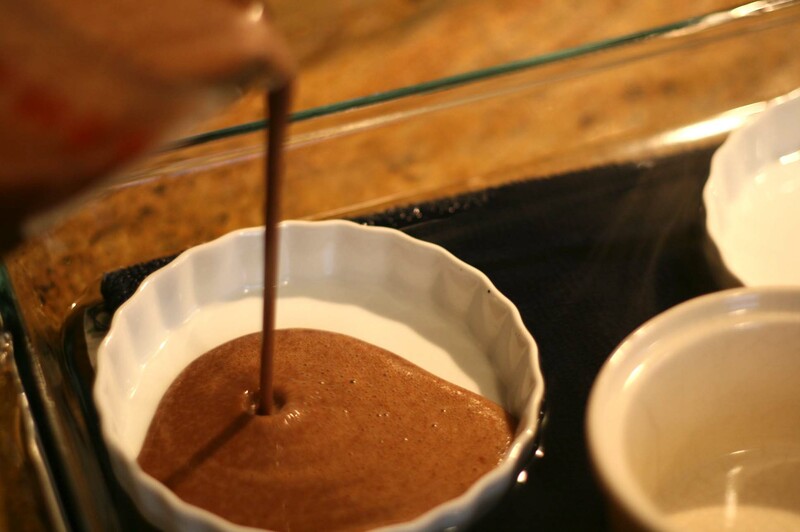 Pour your mixture into your dishes. Give enough to every ramekin. Don't leave anyone out. So I didn’t quite follow my own directions and added the boiling water before I filled the ramekins AND before I put it on the oven rack. If you feel confident in your moving-boiling-water-in-dish-to-oven skills, you can do it either way. If you are a little nervous-nelly about it, put the prepped baking dish on the oven rack first. Fill the ramekins with the custard mixture. Then fill the baking dish with the boiling water. You will want to add enough water so it reaches about 1/2 way up the sides of the ramekins. The water bath around the custard helps steam the custard keeping it creamy while it bakes. Pour the boiling water from one corner of the pan. It will reach the rest of the baking dish. Again, I was reckless and will now move the dish of delicate custard and boiling hot water to the 300 degree oven. No one was injured in this move. Bake for 30-35 minutes until the center of the custards are almost set. If you jiggle them a bit, the centers won’t slosh around much. You can also use an instant-read thermometer and test the centers- should read between 170-175 degrees. Remember you have one of these thermometers because you made the pizza dough right? 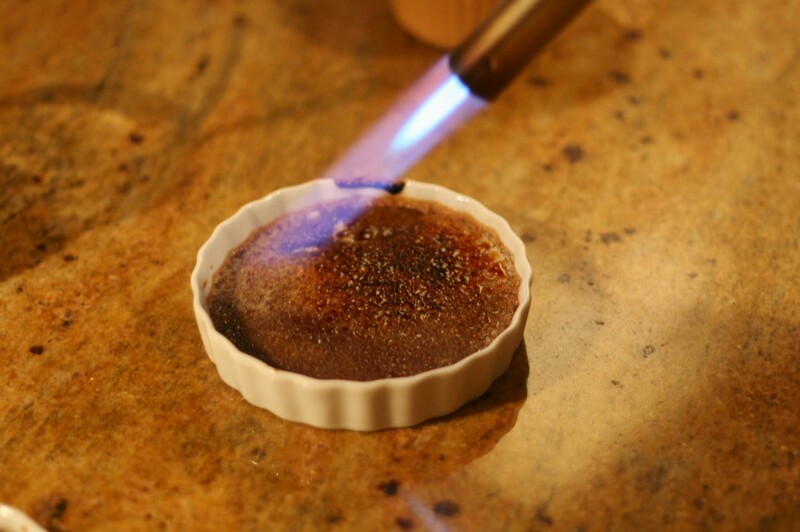 If using shallow dishes that measure under an inch, check the Creme Brulee after 20 minutes. I found those finished much faster than the deeper ramekins. Once cooked, transfer (carefully) to a wire rack to cool at room temperature for about an hour. A friend, long ago, suggested using one of those grabber-tong things (jar lifter) that you use to get canning jars out of boiling water. I know you all do a lot of canning in your spare time right? I know. I know. Me neither- tried it once. I just end up getting my hot pad all wet but lifting it out that way. The water around them is hot so be careful. I have asbestos hands at this point. Once cool, wrap them in plastic wrap and get them nice and cold in the fridge for 3 hours or more. You can refrigerate them up to three days. 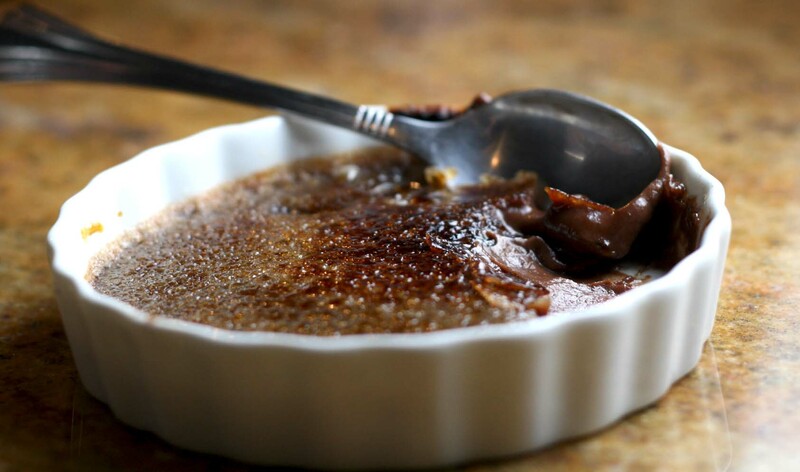 The creme brulee with get nice and thick- this is when you realize this is not just chocolate pudding and begin to salivate a little. 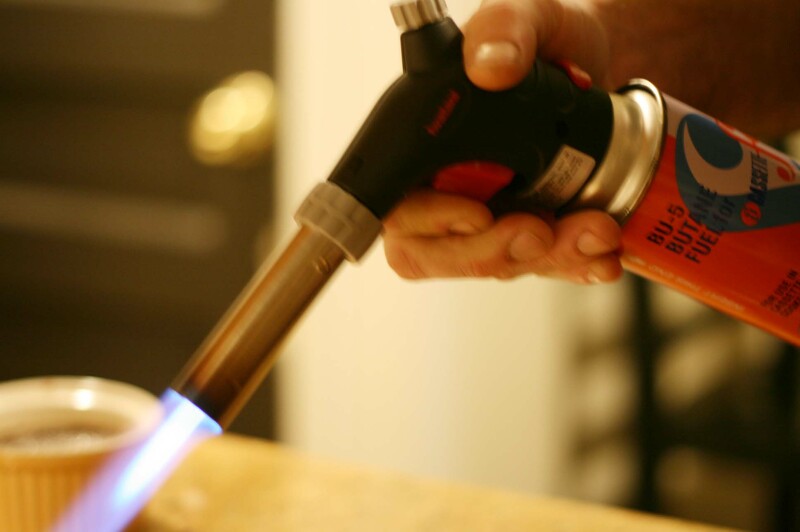 When you are ready to finish them, you can use a torch with a butane attachment. Marumodern bought me this one for my birthday a few years ago. You can also broil the sugar. See the printable recipe above. But who doesn't want to use a torch?! Fun for all, not the picky eater six year old however he will have to wait a few birthdays for that job. Sprinkle about 1 tablespoon of sugar on top of the custard. Using the torch, start carmelizing the sugar by moving the flame over the sugar. Keep it about 8-10″ above the creme brulee- otherwise you’ll melt your cold custard underneath and burn your sugar on top. Keep the flame moving over the sugar. Don’t keep it in one spot too long or it will turn the sugar black, meaning you burnt it. 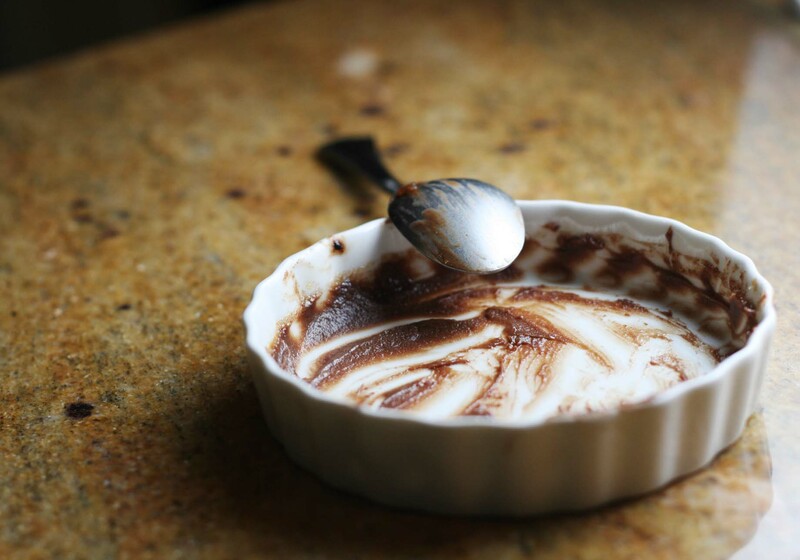 😦 Feel free to practice our torching skills using a pudding pack in a practice ramekin! It’s not hard and it’s fun- you can do it! The sugar will get nice and golden dark. Keep an eye on the texture. The dark chocolate custard underneath and sometimes make it hard to tell how dark your sugar is getting. If you can’t wait and must eat it now (I understand completely), let it sit about 3-5 minutes at least to let the sugar harden and set up. You want that crack/crunch when you put your spoon through the sugar to get to the goodness underneath. If you have more patience, stick them back in the fridge for 30-60 minutes to let the custard get colder again. Dig in and enjoy! Feel free to make small moaning noises as you take bits and roll your eyes in bliss. Dig in! Lovely with a few raspberries served on top too and a glass of Cabernet on the side. This is usually what transpires a few minutes in to digging in. Done. Enjoy! Make it for someone special or that person can always just be you:) Makes a sweet Valentine’s Dinner dessert too. I’m taking requests. What recipe do you want to see explained? I’m just perusing my favorites but what do you want to know more about..? Tell me, I will try to oblige! This entry was posted in Dessert and tagged chocolate, creme brulee, dark chocolate, dessert, heavy cream. Bookmark the permalink. 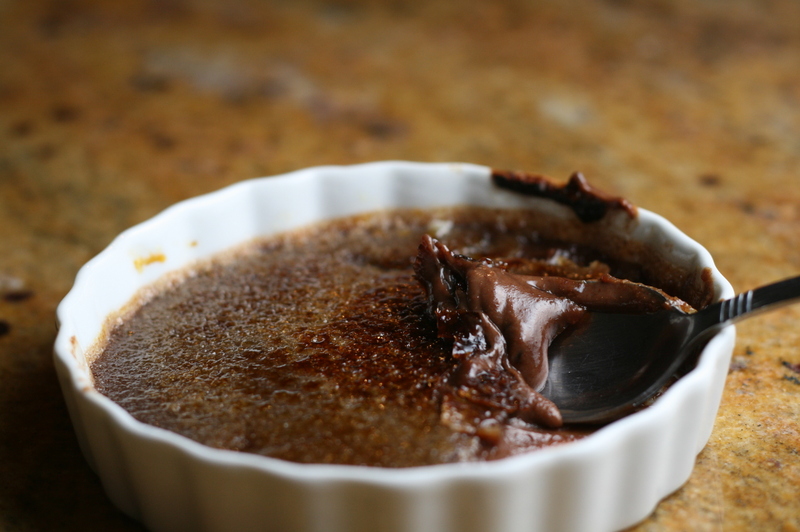 I have been searching the web high and low for the perfect chocolate creme brulee recipe to try. It’s my absolute favorite dessert ever, but I’ve never tried to make it. I can tell by the description about punching you in the face that it’s going to be a good one. Thanks! Thanks Paula- let me know how it turns out. I think it’s pretty easy for brulee! And a bag of frozen peas works great for that punch in the face…kidding,kidding. No violence in our household. This recipe may have been what made my fiance consider me to be the “one” however so prepare it carefully for those you really love! I made this and it is absolutely delicious! It was easy to make, and turned out perfectly! Thank you for the yummy recipe!